In order to determine how much mulch you need, you need to calculate the total cubic yards of your landscaping area. Measure the length and width of the area to be mulched in feet. Add all areas of square footage together to get the total square footage that needs to be covered. Make sure you are accurate with your measurements! How Deep Do You Want Your Mulch? Determine the thickness of the mulch you would prefer. 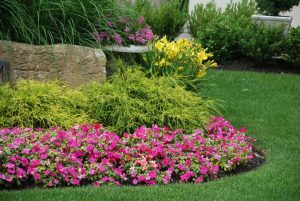 Generally, flowerbeds and gardens require a good 2-3 inches of mulch. If your goal is for heavy weed or grass suppression, you will require 6+ inches of coverage. You can’t go wrong if you estimate a bit more than you need. Simply multiply your total area in feet by how deep your mulch will be in inches. For example, if your square footage is 600 and you require 2 inches of mulch, multiply 600 by 2 to get 1200. Divide your answer by 300 and round to the nearest whole number. Therefore 1200/3 = 4 cubic yards of mulch. Sometimes the calculation for mulch is not that easy. If you need professional landscaping assistance, contact Blooms Landcare. Call (817) 688-5352 to schedule one of our experts to come and assist you.